A watch is an opportunity to show something about yourself, and San Francisco-based Modify, a three-year-old startup offering custom-designed products, wants to make it easy for anyone to upload images of their choosing to make their own custom-designed, modular watch faces. They’ve launched a Kickstarter campaign to help them raise cash for their Modify Watches project, which will also bring printing and assembly to the U.S. in a first for the company. The startup, which has created custom watches for Google, the WNBA, Startup America, ShutterFly and more, and enjoys partnerships with major retailers including Best Buy and Amazon, has had a nearly endless stream of requests from customers to allow them to create their own custom, one-off designs for the modular watches (consisting of a watchface unit and a snap-in, flexible watch band). So far, they haven’t been able to do that, due to cost and logistics, but they want to make it affordable to everyone, hence the $50,000 crowdfunding campaign. Part of that involves moving its printing and assembly facilities to the U.S., which will reduce minimum order size from the 300 or so that were required under its existing system to batches of one. The money will also help the startup source more component parts, build a new customization website, and buy the high-quality, commercial-grade printer required for putting the custom watch faces directly onto the watch face plates in small batches. 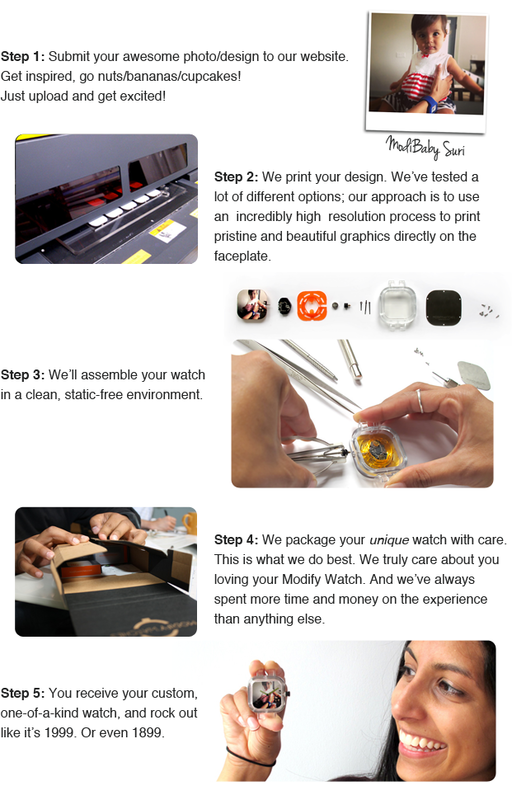 Even while printing custom small batch designs, Modify Watches is looking to keep things affordable. Backers get a fan-designed watch with two straps for just $25, and $49 nets you your own custom-designed face. You could make a watch face of your own face, for instance, which is so meta. The good news with this campaign is that the startup has ample experience building watches already, so there’s a very high likelihood that it’ll be ready to ship these babies come June when it intends to deliver to Kickstarter supporters. So basically if you’ve ever wanted to make your own watch, now’s your chance, and you don’t even have to move to Switzerland and train for a decade under a master watchmaker to make it happen.